This article was initially published in the September 2018 issue of the Global Mining Review. 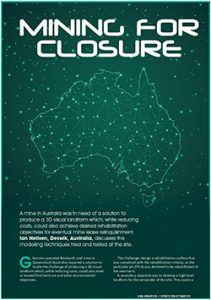 A mine in Australia was in need of a solution to produce a 3D visual landform which, while reducing costs, could also achieve desired rehabilitation objectives for eventual mine lease relinquishment. Ian Neilsen, Deswik Senior Mining Consultant, discusses the modeling techniques tried and tested at the site. Glencore-operated Newlands coal mine in Queensland (Australia) required a solution to tackle the challenge of producing a 3D visual landform which, while reducing costs, could also meet or exceed final land use and other environmental objectives. The challenge: design a rehabilitation surface that was compliant with the rehabilitation criteria, as the particular pit (Pit A) was destined to be rehabilitated in the near-term. A secondary objective was to develop a high-level landform for the remainder of the site. This covers a large disturbed area, mostly a mix of rehabilitated areas, pits and irregular shaped spoil dumps. Deswik applied the standard method of cutting 2D cross-section per pit area to estimate reshape efforts. The detailed planning for Pit A created evenly spaced sections along the strike of the pit. A number of versions were completed over several days to balance cut and fill and calculate total volume. To complete the site-wide estimate, this traditional method was going to require a minimum of 20 sections across seven areas, the equivalent to two weeks of planning to construct the sections and report the outcomes.